One of my first experimental challot was Honey Wheat Challah - Cinnamon Roll Edition, a whole wheat version that I ultimately wasn't all that happy with. 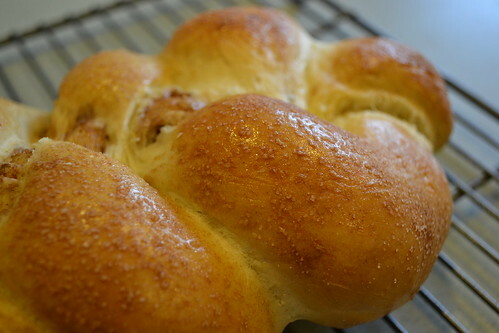 Well, I tried making a white challah with cinnamon sugar instead. And, it's AMAZING. 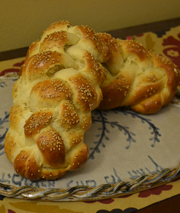 Use any recipe of challah you like. I used the halved version of my challah recipe, with 2 eggs instead of just 1. I think I'm actually going to post an update to the halved version, because 2 eggs seems to be better. 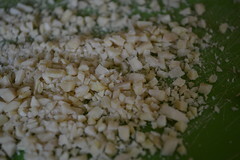 Chop a small amount of slivered almonds (honestly, I didn't measure). 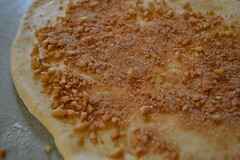 Mix with a sprinkle of sugar, sprinkle of nutmeg, and about a 1/2 teaspoon of cinnamon. 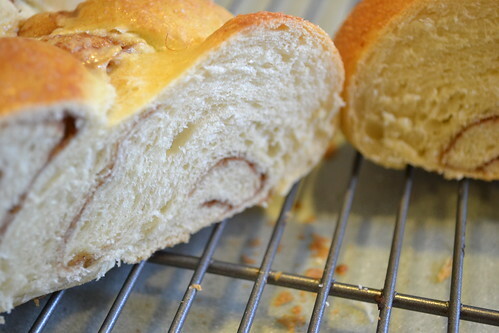 I used the same method from the Honey Wheat Challah - Cinnamon Roll Edition, rolling out flat with a rolling pin, filling, and then braiding the strands together. Once again, make sure you keep the seams of the braids downward when you make your braid. Bake at 350 for about 35 minutes! Enjoy!! !